The Ross of Mull is the most beautiful, wild and remote place you can imagine. Close to the sea and weather, it has been the location of many of our family holidays over the years to cook sausages on the beach and walk to white sandy beaches. 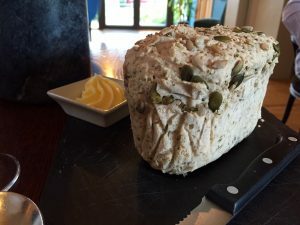 The produce of its natural larder has largely headed elsewhere over the years, but now locals are beginning to feed the dribble of visitors who stop off on the Ross instead of ploughing through on a tour bus to Iona. Down near the shore and in a remote corner, is the Ninth Wave Restaurant. It seems incongruous in this landscape where so many people are eking out an existence, but it is actually a little haven of food delight with superb, friendly service and some great food. Using local, sustainable and seasonal food, the Ninth Wave is also supporting local producers. Booking is essential and you will not get in without it – either because the little restaurant, which takes 16, is full, or because owner, John, heads off in advancce in his fishing boat to catch that night’s dinner. The courses are small, which allows you to create your own taster menu. 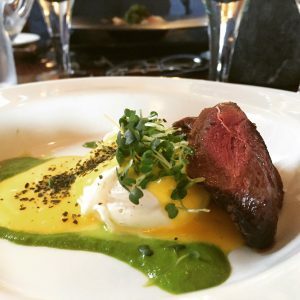 Starters of pigeon breast with a soft poached egg and hollondaise, or wonton soup, were a zingy mix of flavours. There were so many tastes bursting through, we enjoyed the challenge of remembering what the flavours were from the menu. A further course of local smoked trout with mussels and cucumber, was presented beautifully, with a tiny jelly and a tumble of fantastic smoked fish. In little places like this, the photography has to surreptitious, but it is necessary when the meal is so pretty. Others had smoked cod (clearly they love their smokery here! ), a soy-infused venison and an applewood cheesecake with the freshest home-caught crab, which I could not try, but the gluten-eaters said was fantastic. I also enjoyed the freshest-ever lobster (caught that morning, of course) with lightly spiced kedgeree and a soft boiled egg- totally delicious. 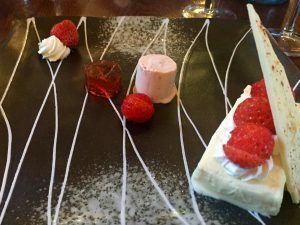 The puddings were also fantastic and the gluten free strawberry dessert I enjoyed included homemade white chocolate, a vanilla parfait, a beautiful tiny strawberry jelly and ice cream (yes! ), and homegrown, freshly picked strawberries. There was also a sorbet choice, with little additions of chocolate. I had told them in advance that I was coeliac, which you have to do with such personal dining, and they were thoughtful and clear about options and choices. It is always best with dining such as this, to give advance warning of any allergies or issues. And here is the highlight: diners are given individual freshly-baked loaves of bread for their table, to cut off slices as they go. As the gluten free eater, I was brought my own little loaf of herb and pumpkin crusted bread. Scone-like, crumbly and very tasty, this was a great treat. Leftovers can be wrapped up and taken home, but I only remembered this two miles down the road – such a shame, but a good excuse to go back! The finale of freshly picked applemint tea (literally: John nipped out to the garden!) and homemade chocolates (rhubarb and custard flavour =yum), finished off a really special family night out. The decor is beautiful and totally appropriate for this wild landscape. There is an incredibly neat and burgeoning kitchen garden which is worth a look as you head home, and the service is fantastic. Owner John, brings humour and thought to the service and makes the evening a joy, and while we never saw chef, Carla, her love of food came through in the cooking. The Ross of Mull is not everyone’s choice of holiday destination and although it should be, I am glad it is not or it would be busy! It is a stunning place and worth a visit – and when you are here, make sure you put the Ninth Wave on your agenda – for good quality food (both gluten free and with gluten in it! ), it is just a delight.